The other night I was occupied with Rory, so I asked Brett to warm up some chicken nuggets and corn for Cardin. Mind you, I thought this would be a fairly simple task since its really just a re-heat; no major cooking involved. Listen lady, this is one of those times where I would be wrong. I shook my head and walked into the kitchen. The container of corn lay, strewn about my counter and kitchen floor. The account I was provided with was somewhere along the lines of this, “a giant mushroom cloud of steam exploded out of container and melted my entire fingertip off; DOWN TO THE BONE”. Mmmmmhmmmm. Listen lady, run some cold water on it and call it a day. For the remainder of the night, I proceeded to pick up corn kernels from all corners of the kitchen. To make it extra special, the corn had some melted butter in it so it really slicked up the floor nicely. Fast forward to last night and Cardin wants the exact same meal. Imagine that I’m a little hesitant to let Brett heat the container of corn. But, I pushed that aside and he succeeded without waxing the floor. I however, could not let the opportunity pass by so unnoticed. We put the leftover corn in the fridge and I attached a note to it. Warming me up can cause gravitational shifts in the earth and force consumers to plummet my contents all over the kitchen floor. This will piss off your wife since she’ll be the to clean up. 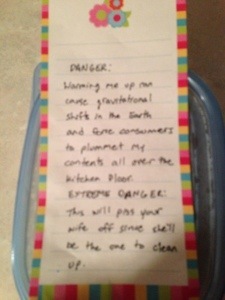 The best part is that he has yet to notice this note yet. If you can’t have a little fun with each other than what is the point, right?